Please join us on the 6th of May, 2012 (Sunday) for the 4th annual La Crosse Festival Marathon. The Marathon is going to start at exactly 7:00 am in Pettibone Park. The marathon is going to begin just outside of Pettibone Park. A little after the start, the runners will have to run the perimeter of the park by enjoying the great Mississippi views as well as the downtown part of the city. When you exit the course of the park, you will cross the Cass Street Bridge which spans the Mississippi River. 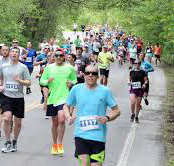 Once you enter the downtown part of La Crosse, you will follow the course into Riverside Park and make a loop around it, while enjoying the views from the opposite bank of the river. When you are exiting the park, the course will head south with the perimeter of the town. You will make a 1.5-mile trip back and out down 7th street before you enter the Gundersen Lutheran walking trails. Then you will continue south through the residential areas, and turn north using the path under the Mormon road viaduct. While you are heading north in the shadows of the bluffs, you will make a loop near State Road Elementary School, and you will gain some extra mile before you continue in the same direction. After you cross Losey Blvd, the course will go through a few neighborhoods and the Cass Street, before you finish at Myrick Park. The La Crosse Festival Marathon is a USATF-certified course with the number WI-11008-DM. However, you will have to pay an administrative fee of $10 for switching the events as well as the difference between the races. If you want to move to a lower-priced event, you will not receive a refund, and you will still have to pay the above-mentioned fee. You can neither transfer the event fee to next year nor refund it. The registration closes on the 30th of April 2012, and there will be a limited option to do so in the Packet Pickup. However, you should note that you will not be able to register during race day. Because of safety reasons, we strongly advise you against using any of these devices during the event. If you really want to use one, we hope that you will keep the volume low enough to hear the instructions as well as traffic. Since the marathon course is on not paved bike trails, the marathon is not suitable for competitors in wheelchairs. However, if you want to give it a try, we will accommodate you with a 6:55 am start. If you are impeded from participating, you will not be able to transfer the fee to the next year’s marathon. But, if you write us a request, we will give you a t-shirt from the race. You can pick it up after the contest at the La Crosse City Hall in the Parks and Rec. Department. We can also mail it to your home address for $10, but you will have to provide us with your personal details like name, number address and shirt size.